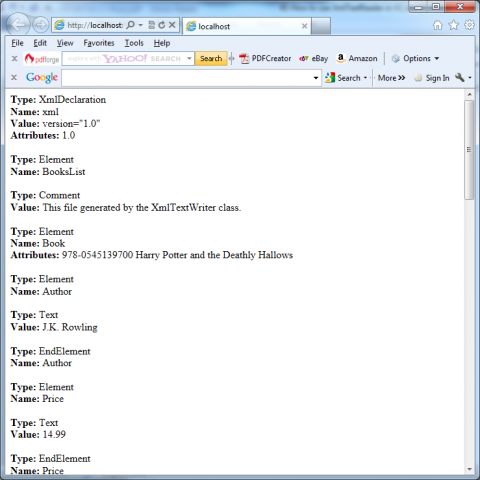 You can use the XmlTextReader class when you want to read a XML document in your code. The XmlTextReader moves through your document from top to bottom, one node at a time. You call the Read() method to move to the next node. This method returns true if there are more nodes to read or false once it has read the final node. The current node is provided through the properties of the XmlTextReader class, such as NodeType and Name. // describes the information read from the XML document. // Parse the file, and read each node. // for an element. It’s not available when reading the inner content. // The value is when reading the inner content. // Copy the string content into a label to display it.